The Seme Area Command of Nigeria Customs Service has moved to strengthen it’s inter agency operational tie with the Nigeria Police to enhance national security. Mr. Willy Egbudin, Customs Area Controller of the command had described the cordial relationship between customs officers and their counterparts in the police as a very necessary collaboration for intelligence sharing and possible joint operation where and when necessary. Egbudin stated this on Thursday when he visited the Assistant Inspector General in charge of Zone 2 of the Nigeria Police, Mr. Mamman Tsafe mni and the Lagos Commissioner of Police, Mr. Umar Manko mni. He also said that collaboration between security agencies needed to be strengthened to tackle the current insurgency in the country while thanking the police for their support through the years. “In order to tackle the security situation in the country, all security agencies must work together. The purpose of this visit is to strengthen the existing ties between customs and police officials to help in stopping smuggling”. “Some Inhabitants around Seme Border take smuggling as their trade but we have been employing intelligence to tackle it in order to prevent violence or bloodshed.We want the police to keep putting efforts and keep on with its support”, Egbudin said. He commended the police at Seme for the assistance being rendered to customs. “We would continue to seek for more from your command because we know you would give us all the necessary support and we would achieve our respective aims,’’ he said. 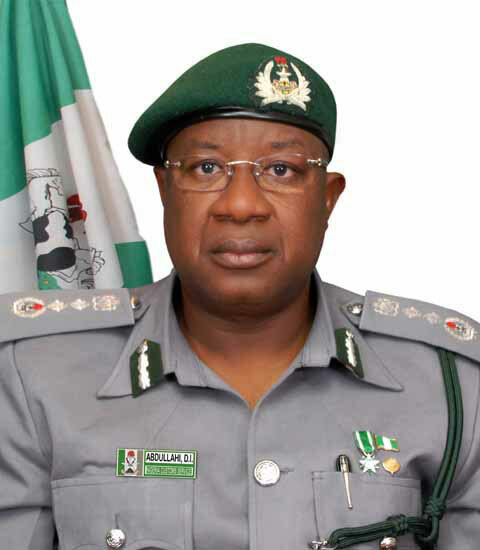 The Lagos State Commissioner of Police, Mr Umar Manko, on his part pledged to support the Seme Command of customs. The Lagos State Commissioner of Police also admonished on the need to work together as blame for official misdemeanor is often times placed on superior officers. “When crises happen, the society looks up unto us (respective heads of our commands). So, we must work together. We would continue to render our assistance to make sure that crisis is averted and peace continues to reign,’’ the CP said. The visit is part of Egbudin’s drive to build stronger relationship with all stakeholders at the border and as a mild strategy to combating smuggling with maximum result and minimal casualty. He had earlier visited heads of other security agencies operating within the border before his recent visit to the 2 high ranking police officers in Lagos.